Provide food and entertainment for your guests like never before! After years of casino and corporate entertainment, BK has combined his talents as a comedy magician and pizza making mastery to bring you an unparalleled in-home dinner show experience! ​In only a few hours he'll work his magic in your kitchen to create his artisan deep dish pizzas. ​After pizza, you and your guests will enjoy BK's highly nonsensical comedy magic performance in which he combines the best of his stand-up comedy magic and close-up sleight of hand. Ideal for 10-24 guests. 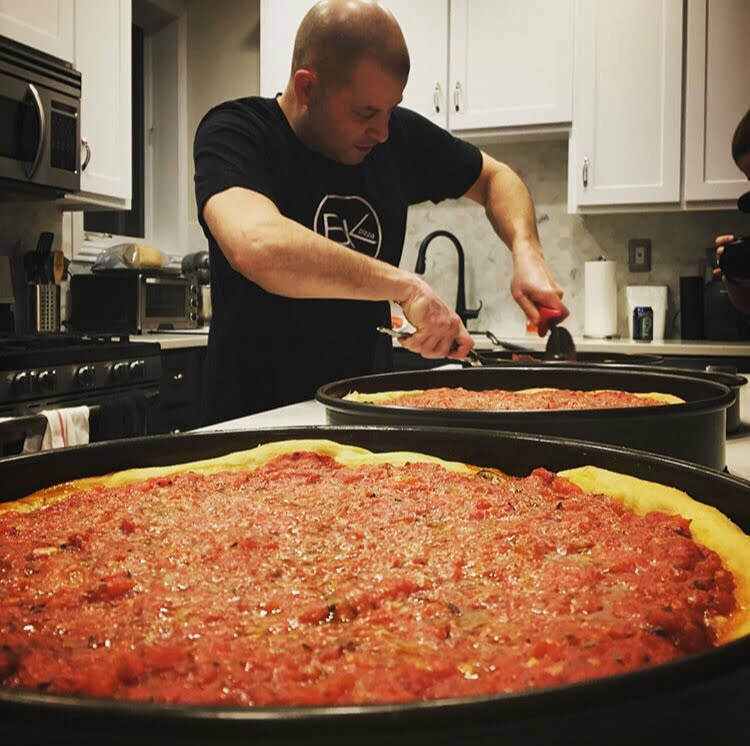 in 1995, BK began perfecting his deep dish pizza. He tried numerous recipes week after week, would eat one slice, sometimes only one bite and then pass the rest off to his neighbors. "They loved me!" ​He got close to what he thought was the perfect flavor and consistency but felt it was sleightly (see what we did there?) amiss. With months of trial, the help of some of his more than willing taste testing friends, the Chef at Pizzeria Due (sister restaurant to Pizzeria Uno), his late great pal Chef Stutz and a few others, he nailed it! All pizzas are 12" deep dish and have a base of mozzarella. Artisan cheeses are considered a topping. ​Q: What size pizzas do you make? A: I make 12" pizzas and serve them in smaller slices so your guests will have room to enjoy trying multiple flavor profiles. A: Please contact me as this will be based upon the number of guests at your event. Q: Where do you get your sausage and bratwurst? A: Get? I make my own. I usually get pork from from a local butcher and spices from a local spice shop. Q: Can I have you private chef a pizza dinner without the magic show? A: What you don't like magic? Of course! I love-a-to make you a pizza! Q: Do you make your dough by hand? A: No, I make it on the counter by the sink! Ha! Actually I finish my dough by hand to be sure I get the exact consistency I want. I can make it from start to finish by hand but stand mixers allow me to make multiple batches at one time. Q: Do you make gluten free pizza? Q: Why do you like to use imported Italian San Marzano tomatoes? A: What's with all the questions? In my opinion, they have a better flesh to gelatin ratio which leads to a richer/sweeter flavor and makes them easier to work with. Also the sodium content is most often a fraction of what you find in our domestic packed tomatoes. Q: Do you always use local and or organic ingredients? A: Magic since the age of 10, pizza since 1995 and Magic by the Slice launched in January 2014.